Before I turned 18, I lived in 4 countries and attended 6 schools. Transition, adjustment, flexibility – these were concepts I understood and embraced. It was after I settled into a dorm room at Columbia University as a freshman that time stopped moving so quickly, and my attitude started to shift from adaptation to identification and independence. I was no longer living with my parents, so obedience and duty had to come from within. Suddenly I was relying on my conscience instead of my parents to discipline me, and navigating a moral code for the sake of principle and not deference. College juxtaposed endless opportunity – hundreds of academic majors, internships and lectures – with inescapable mundanities – assignments, alarm snooze buttons, laundry – and it was up to me to prioritize all my activities in the way that best expressed my identity. Inevitably I signed up for a class on Middle Eastern and Indian Civilizations, eager to see my culture in a glossy textbook. Conversations erupted about religion, caste, education and the controversies embedded in these constructs. I’d contribute with personal experience, having lived in India, but 21st century Bombay does not explain these things very effectively. I remembered what my father would always say to my siblings when we had questions – and were not satisfied with his answer: Go to the source, go to the texts. All the answers are there! Don’t make judgments before you have fully sought out an answer. Study which texts? Pray to Whom? Visit which temples/ashrams? Where did one start? Spiritual life is overwhelming in the plurality of ways it can be approached and analyzed in order to understand, embrace, and live by it. Yet Bhakti yoga appeals to people the way Krishna appeals to the Gopis (Krishna’s milkmaid servants): by calling out to the curious individual, singling him out and welcoming him. My foray was an on-campus Bhakti Yoga discussion group that involved copious amounts of free, Indian, vegetarian food and two very friendly Bhakti monks in saffron robes, armed with many copies of the Bhagavad-gita. The crowd was casual, the conversation comfortable and the food consummate! Perhaps my priorities were misaligned at the time – my focus being more on the food than on the text – but a fulfilled stomach abets a fulfilled mind, and I was moved to speak up, when my mouth was finally empty. At first, I felt like I knew more than my counterparts since I knew the premise of the Gita, the principal characters, etc., but with each verse that we explored, I became less concerned with the pace of the pack, and more disarmed by the language of the Gita. Love everyone the same way – your mother the way you would a neighbor, and a stranger the way you would your mother? Dust off the layer of lust that coats your heart and turns love into attachment? The Gita chastised human temperaments, without temper, and revolutionized our discussion group’s thoughts, without starting any fights: we were all Arjunas, blessed with Krishna and his words just inches away from our ears (next to our plates of pasta and halava!). I was amazed at the potency of the words. I questioned The Gita teachings still further, and received patient responses from the same monks at the Columbia Bhakti get-together. They helped me put life, mortality and meaningfulness in the perspective of karma and dharma (duty). We glorify Krishna to practice compassion and humility, and Krishna glorifies us for our efforts, creating distractions from the illusion that surrounds us and allowing us a glimpse of pure interaction. It was easy to compartmentalize my Gita study into a weekly activity and keep busy with academics, other extra-curricular activities, and the wealth of distraction that New York City had to offer! But after graduating and starting a full-time job, my thoughts seemed to toggle between tasks at work, and subsequent fatigue at home. Having spent the day staring at a computer screen, I was too tired to read at night. My copy of the Gita sat on a shelf, collecting its own proverbial layer of dust, hiding from me its potential to lessen the stress from my daily routine. This could not last forever, of course; circumstances found me at a Krishna-Bhakti center, hungry for halava and an honest discussion. 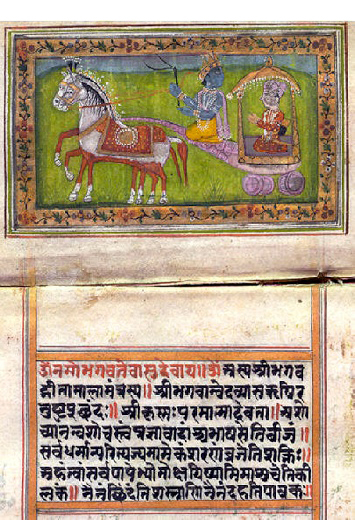 I found the energy to pick up the Gita again, determined to read it from Chapter 1 to Chapter 18. Comparing the examples of service and compassion in the Gita to my varied interactions at work have shown me how power and control wrongly dominate the workplace – and how easy it is to get caught up in it. Every visit to the ashram is personal and intimate, while the office can feel like a maze of cubicles. I have re-prioritized once again, to define my attitude toward work with the determination and humility I draw upon when discussing the Gita. I am hearing its language – or noticing its lack thereof – in newspaper headlines about greedy leaders, in lust-filled enterprises, and rejoicing in the examples Krishna puts forth to his devotees when we most need it. I have tasted the endlessness of the Gita, and I have returned to it! Aditi Sriram graduated from Columbia University in 2007 and has been working in New York City since then. Her spiritual heritage and contemporary search for truth and wisdom led her to a time-tested source—the Bhagavad-gita. Below are the Gitas we recommend at the Bhaktivedanta Center. 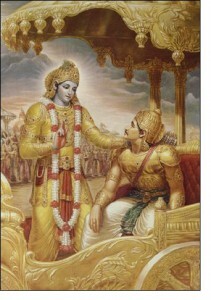 Left: The Bhagavad Gita: its feeling and philosophy by Tripurari Swami. Clear, erudite, well-written verse explanations. Tripurari Swami is the blog editors’ Godbrother, and has ashrams/monasteries in northern California, and Costa Rica. 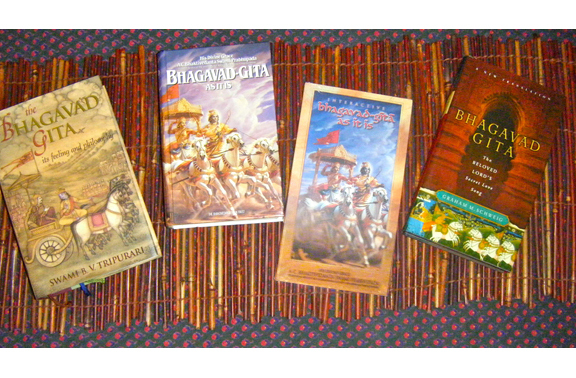 Right: Bhagavad Gita: The Beloved Lord’s Secret Love Song by Graham M. Schweig, Ph.D. (aka Garuda dasa). A beautiful, lyrical translation, saturated with beauty. No purports but with good footnotes and almost 100 pages of textual Illuminations, which reveal the authors great insights into the subject matter of the Gita. Garuda dasa is the blog editors’ Godbrother and comes to the Bhaktivedanta Center to give class when time permits.